trying to figure out my lower fuel economy numbers on my 2013 Ford Focus 5 Speed. I've been running logs of Fuel Trim & O2 Sensor data, and it seems like the O2 is reading a bit rich (~0.6V) while the STFT and LTFT are positive. I may be wrong, but I thought the STFT and LTFT adjust to bring the O2 sensor to ~0.5V. I've attached a shot of a 110km cruise STFT, LTFT, and O2 Sensor Data. This stayed pretty constant throughout the cruise. Any ideas? Fuel economy averages about 27mpg. I'll take 27mpg average.....When did you swap out the o2 sensor? I haven't swapped out the o2 sensor yet. I was going along that path, but I figured if the o2 sensor was reading rich the fuel trims would cut, regardless if the reading was right or wrong. Is this thought process wrong? Your O2 sensor should constantly be switching up and down very fast. If the O2 sensor is just hanging out while you're watching the live data it's dead/lazy. You need to watch it in live data. Last edited by zacautomotive; 04-08-2019 at 08:55 PM. Unless it's heavy city traffic, 27 is low for a MK3 5spd. I get 32+ with a near 50/50 mix, and that's with me smashing the pedal now and then. 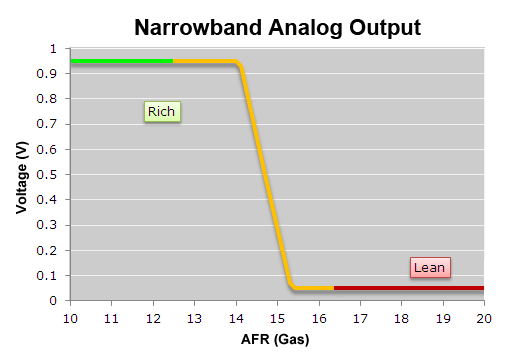 If you look at the output curve of a narrowband O2 sensor, the difference between it reading full lean and full rich is tiny. You cannot tune AFR far from stock with a narrow band O2 sensor. So anything that is showing an average of a fractional voltage is fine. Also, when the engine is under heavy load, open throttle, passing, whatever, the ECU will add additional fuel, to pull the mix down. The additional fuel prevents knock and keeps EGTs down to safe levels. So given that, a higher than 0.5V average is entirely expected. Typically, the AFR is constantly in flux, and the ECU counts crosscuts on the O2 sensor signal. In closed loop mode, where it's adjusting the mix based on the O2 sensor feedback it expects the O2 sensor to swing back and forth between 0 and 1 volt, and this continuing to happen is how it knows that the O2 sensor is still responding properly. If it were to get a constant 0.5V signal (Which would mean a "perfect 14.7:1" mixture) for any length of time, it would probably throw away the O2 sensor input. This is sometimes a strategy for dealing with heated O2 sensors, where it uses a pull-up resistor to force the output to 0.5V until the sensor heats up enough to start reporting real values, since in normal operation, a constant 0.5V is impossible, the ECU knows that this input isn't valid, it will keep operating in open loop mode.